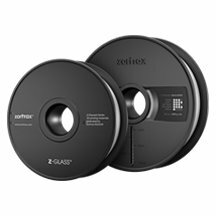 Find all the Z-GLASS filament spools for the Zortrax 3D printer. Z-GLASS is a thermoplastic copolyester mixed with glass fibres. Made for printing translucent items with remarkable mechanical properties: high tensile strength, high temperature and abrasion resistance. This material is also highly resistant to salt, acid and alkali. Z-GLASS spools are always available at the best prices at Makershop3D. Check out all our advice and guidance before you buy online with expert product descriptions containing all available information.